We love ProOmega Junior because it is the highest potency for kids and the capsule is small. The soft gels are very easy to swallow and come in a great strawberry flavor. They are very kid-friendly. 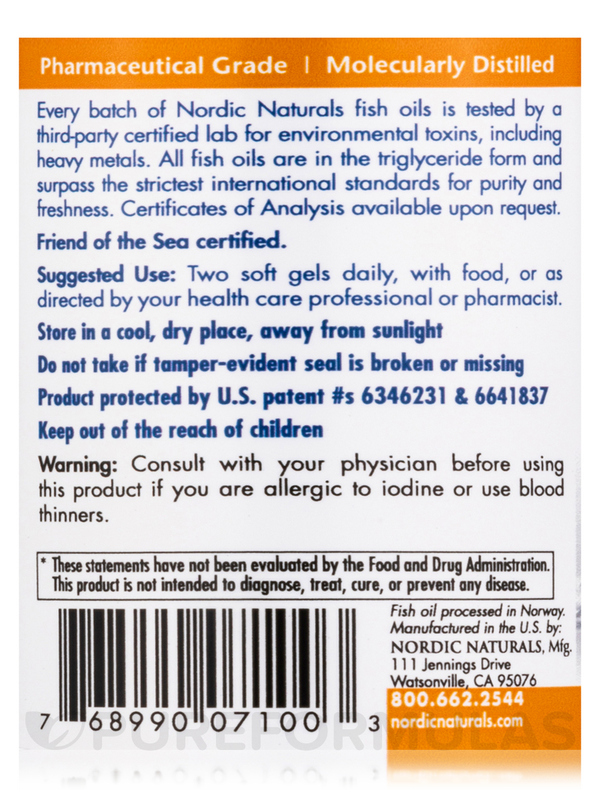 My son has no problem swallowing ProOmega Junior 500 mg by Nordic Naturals and it also has no fishy taste! 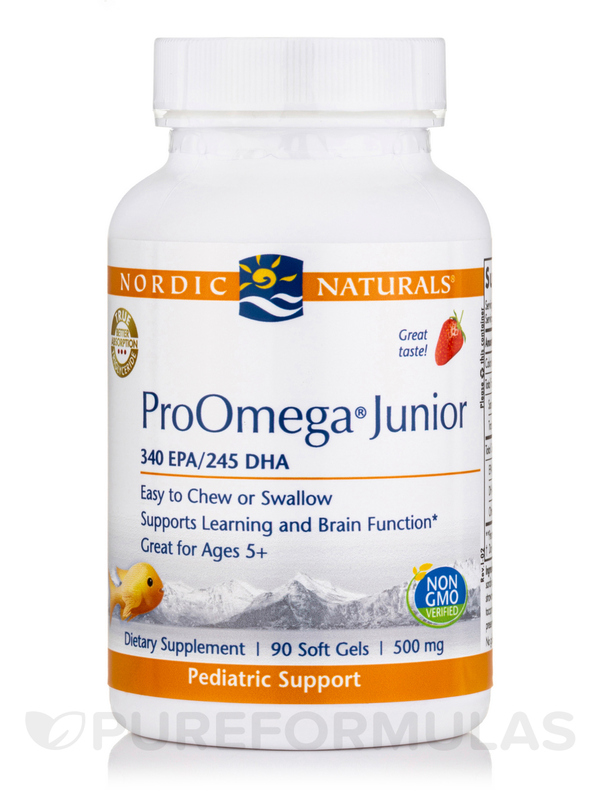 These ProOmega Junior by Nordic Naturals are easy to swallow by my 6 year old and he likes the mild strawberry flavor. A friend recommended omegas for my daughter that was having a lot of bad dreams. I figured it couldn't hurt and tried the ProOmega Junior 500 mg by Nordic Naturals. Much to my surprise her bad dreams are basically gone. We had suspected that the bad dreams were due to hormonal imbalances and the ProOmega was enough to balance everything out. Now my 11 yr old daughter won't let me forget to order when we run low. It is sourced from small fish. I have been taking ProOmega Junior 500mg by Nordic Naturals for a long time. I was unable to take other other fish oil supplements due to the size of the pills. My Cholesterol levels also dropped, my MD is very happy about that! Very effective for me. Good results, yummy taste! ProOmega Junior 500 mg by Nordic Naturals has these pills that are at the right size for kids to swallow or chew. 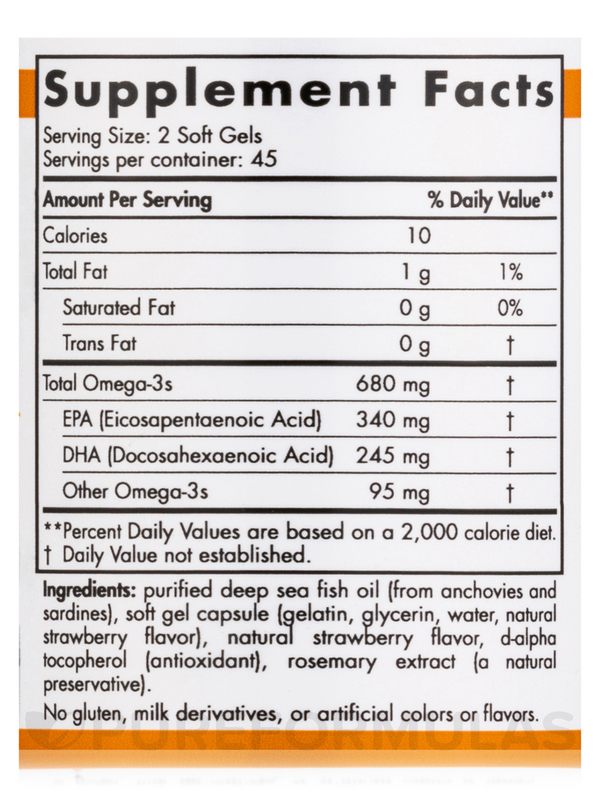 ProOmega also offers a good amount of DHA and EPA, and the taste is well tolerated by my children. Great for swallowing or chewing Children love it. 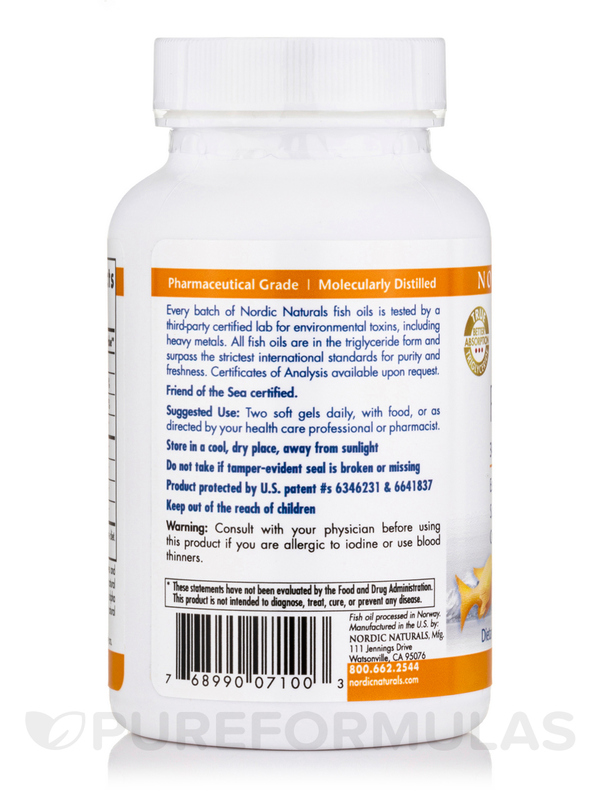 I take fish oil as an adult and prefer ProOmega Junior 500 mg by Nordic Naturals. My twelve year old loves the flavor of this ProOmega Junior 500 mg, Strawberry Flavor by Nordic Naturals and takes this supplement willingly. Good for my kid’s brain. Tasty and palatable. No fish burps. Tastes and smells really good! Perfect if you don't want to swallow a bigger pill. ProOmega Junior 500 mg Strawberry Flavor by Nordic Naturals is about a half an inch long as opposed to most fish oil pills, which are usually an inch long. And it's got about the same epa/dha as the regular Nordic Naturals Omega 3. Awesome! 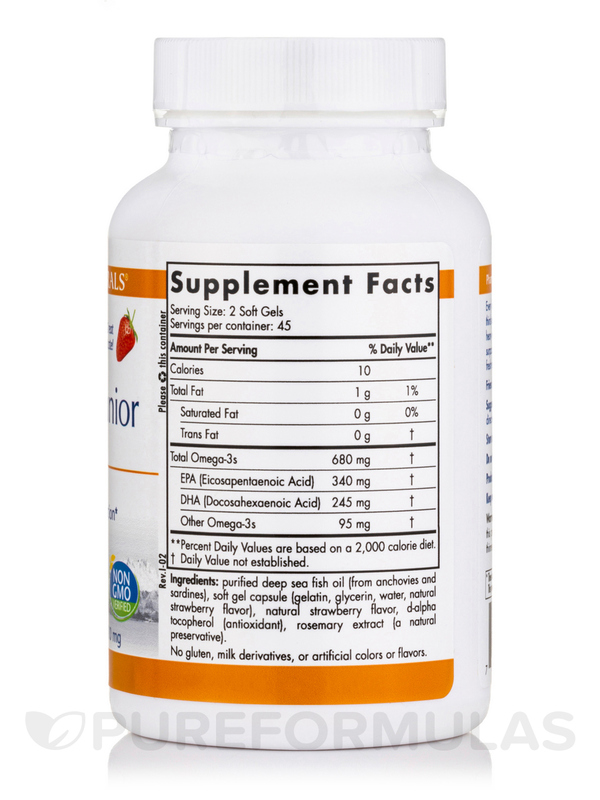 I love the amount of EPA in this ProOmega® Junio 500 mg, Strawberry Flavor by Nordic Naturals. It is the highest out of all the children supplements that I have have searched far and wide for. My son has development delays and I know when he has high amounts of EPA he just works better. Very satisfied. The highest level of EPA of all children supplements I could find. My son can't swallow so he chews them and the flavor isn't fruity enough that he can take alone. So he either chews it simultaneously with a scoop of cereal or a chewable multi vitamin to mask the taste. I ordered Full Spectrum Turmeric by Planetary Herbals for my 6 year old. He does not swallow capsules but these are described as "chewable" They are not, it's not a good experience to try and chew them, the capsules don't seem made for that. My husband tried one as well and pretty much gave the same 'face' as my son. Do NOT purchase these for the 'chewable' aspect. Only two were taken but since opened items cannot be returned I guess I'll be taking this bottle. Not chewable - False advertising.